Roundup of Sunday's events, which were relatively quiet in terms of confrontations but many school and university occupations are going on strong. Today it was a "quiet" day with no big demos, a problem was the heavy rainfall that started at some places in Athens. A few hours earlier (at 6:00 Greece time) there was a gathering at the murder point in Exarchia, organized by the inhabitans of Exarchia. Quite enough people attended, it is difficult to say number because a lot were coming for 10 minutes or so and then leaving. There was no police there, at least no police with uniforms, so the situation did not get any worse. In an attempt to inform the public of what is happening, because the media have almost stopped reporting about the demos, 4 different radio stations were taken over today and the comrades broadcasted. The first was 9,84 this morning (a popular Athens radio station) and on 8:00 this afternoon 3 different radio stations were also taken over (virgin, best and en lefko). On the morning broadcast, the mayor of Athens together with his bodyguards visited the offices of the station and had a verbal argument with the people that were broadcasting then. All take overs started and ended peacefully. In Thessaloniki, there was a motorbike and bicycle demo that lasted quite long. Comrades passed from various areas of Thessaloniki and were stopping on various places and reading announcements, also distributing leaflets to the public. In Petroupoli, a suburb of Athens there should be now a demo called from the Anti Authoritarian Movement but I think it is raining now, I am not sure if it has started or not. The occupations of Polytechnio and the Law dept of the Uni of Athens are still holding, as well as the take over at the town Hall of Ag Dimitrios and one more in Chalandri. Tottally in whole Greece, 69 high schools and 103 university departments have been taken over by students and no classes are taking place. Tomorrow morning there is a call for a demo outside Euelpidon, the courts of Athens, as a lot of arrested comrades are passing from court hearings. It is essentiall that a lot of people should be attending that. The assembly of the occupied schools has decided that tommorrow the high school students of Athens will demonstrate outside the central police headquarters of Athens (GADA). 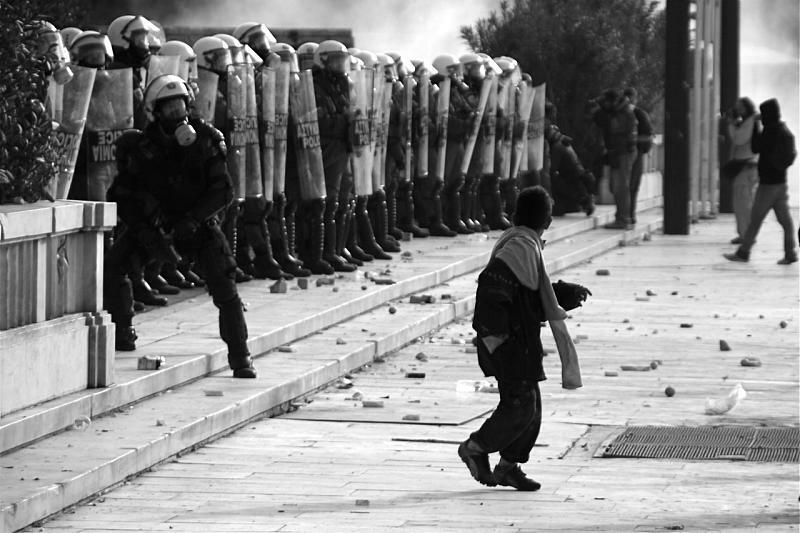 On the same time, the school students of all Greece will be demonstrating outside the police departments of their area. A DEMO HAS ALSO BEEN ORGANIZED TOMORROW AFTERNOON AT 6:00 AT PROPYLEA. A week after the demo of last Monday, all of us and even more we should be again at the streets of Athens. No matter how much they tried last night and throughout this last week the Polytechnic is still taken over by comrades and will continue to be. Yesterday RIOT police together with police special forces were in nearly every corner around the polytechinc and the nearby streets. Their aim was to try and draw out the comrades from the polytechnic area and arrest them (they are not allowed to enter the polytechnic without permission). There was a call out for comrades to all meet at the alley that Alexis was murrdered and start demos from there. Some of the us went from there and attacked the Exarchia Police Department, others went for demos at the city centre. These are demos that were decided on the spot, dont look out for any announcements etc. Chaos was created in front of the Exarchia police department when a car belonging to the undercover police was set on fire. Riots started, that continued to Exarchia square. Road blocks were formed, and the police was trying to push everybody out of the square. Members of the public, people who were in their houses, got out and demanded from the police to leave the area. ASSASINS OUT OF EXARCHIA were shouting. The police responded with chemicals, but comrades and public effectively managed to push them back and out of the square. People were throwing them flower pots from the balconys as well as water, everybody was trying to do whatever to get the police out of there. A 60 years old man that was on the square as well, had to be transfered by an ambulance to the hospital because of serious breathing problems. There was a rumour that passed from mouth to mouth in the area that he died but I cannot confirm that, I can only confirm that he got in the ambulance. Clashes with the police also took place at Stournari str, is the small street that is on the corner of the polytechnic and Patision avenue. Petrol bombs were thrown towards the police who responded with chemicals. I have heard that from that live streaming camera from zougla.gr the petrol bombs were seen.. I dont like that camera very much to be honest. At about 3:30 in the morning while trouble with the police still existed a comrade was hit on his head, from a stone that a police man threw... Throughout the week the police has the habit to return the stones that they are thrown at, a LOT of people have been injured because of this, even people that are just passing by. No ambulance took the comrade, I dont really know how he got to the hospital, maybe by a car with somebody. I told you yesterday that the demo that went towards Psyri was attacked by the police there. An another demo that also started from Exarchia, did a circle around the centre, passing from Gazi and other areas. They attacked to various banks on their way and broke CCTV cameras. A portion of the demo was trapped though when reached the Omonia square, around 50 people were detained and with a blue police van were taken to GADA, the police headquarters in Athens. Some of them were beaten by police, especially girls and particularly if they were under 18. They were finally all left free at about 5 this morning. I know that the sit down demo at Syntagma square was also attacked by the police, for no reason at all. Stella has allready told you about this, if any of you were watching the live streaming camera may have seen that. After the first police attack that took them out Syntagma square a second happened at about 3:30 in the morning and the demo was completely destroyed. A bank at Pattision str, (branch of the National Bank) was set on fire. During all these days the police in Athens only has used about 4,5 TONS of chemicals. Because they run out they ordered new ones from Israel, we had a taste of them last night. It is the worst feeling that I have ever had from police chemicals, very very strong. One thing is certain... Israeli police has managed nothing with these chemicals against Palestinians, so they are not going to stop us either. Meanwhile, there were heavy clashes between the police and demonstrators in the areas surrounding the Athens Polytechnic campus. Tens of molotovs were thrown at them and they seemed to have little space and materials with which to respond. Earlier on in the night a peaceful gathering at Syntagma square that had been called by bloggers, was attacked by police at around 1.30am, with tear gas; their single aim being to disperse this tiny crowd of about 50. It is very hard to keep up with the day’s events; I will mention some of Athens IMC’s article titles to give you an idea of the level of activity we are dealing with: “Banks smashed on Panormou street, Athens” | “Eksarhia residents kick out riot police from the neighborhood” | 700 high schools occupied by their students across the country | Eksarhia police station was attacked by approx. 100 people | barricades all over the Eksarhia neighbourhood on the night marking one week since the assassination of Alexandros. More detailed descriptions of tonight’s events and the (much promised) summary of thoughts on what has happened so far, tomorrow. -demo of 500-600 people at Pireos st, closed to traffic, people from the area are joining the spontaneous demo, they're shouting slogans, along the demo cameras from banks were smashed. -the demo continues along Iera st (3.40 am),windows at a national bank branch were smashed. -the pigs pushed away the protesters that were participating in the sit down demo, from the monument of the unknown soldier all the way down the steps at Syndagma square! The protesters were shouting back at them "cops, pigs, murderers' and "burn,let it burn, the brothel of a parliament"
-about 10(pm-sat) people that were at Messologiou st and a few more we started demonstrating towards Monastiraki, we passed through Psiri, Thisio,Gazi where a lot of people got up but most just looked down. We continued towards Iera st and before reaching Omonoia square the riot police attacked us and people started running in the alleys. There is a possibility that there were arrests. Cameras and banks were smashed. In these days of rage, spectacle as a power-relation, as a relation that imprints memory onto objects and bodies, is faced with a diffuse counter-power which deterritorialises impressions allowing them to wonder away from the tyranny of the image and into the field of the senses. Senses are always felt antagonistically (they are always acted against something) – but under the current conditions they are driven towards an increasingly acute and radical polarisation. Against the supposedly peaceful caricatures of bourgeois media (“violence is unacceptable always, everywhere”), we can only cachinnate: their rule, the rule of gentle spirits and consent, of dialogue and harmony is nothing but a well calculated pleasure in beastliness: a promised carnage. The democratic regime in its peaceful façade doesn’t kill an Alex every day, precisely because it kills thousands of Ahmets, Fatimas, JorJes, Jin Tiaos and Benajirs: because it assassinates systematically, structurally and without remorse the entirety of the third world, that is the global proletariat. It is in this way, through this calm everyday slaughter, that the idea of freedom is born: freedom not as a supposedly panhuman good, nor as a natural right for all, but as the war cry of the damned, as the premise of civil war. The history of the legal order and the bourgeois class brainwashes us with an image of gradual and stable progress of humanity within which violence stands as a sorry exception stemming from the economically, emotionally and culturally underdeveloped. Yet all of us who have been crushed between school desks, behind offices, in factories, know only too well that history is nothing but a succession of bestial acts installed upon a morbid system of rules. The cardinals of normality weep for the law that was violated from the bullet of the pig Korkoneas (the killer cop). But who doesn’t know that the force of the law is merely the force of the powerful? That it is law itself that allows for violence to be exercised on violence? The law is void from end to bitter end; it contains no meaning, no target other than the coded power of imposition. At the same time, the dialectic of the left tries to codify conflict, battle and war, with the logic of the synthesis of opposites. In this way it constructs an order; a pacified condition within which everything has its proper little place. Yet, the destiny of conflict is not synthesis – as the destiny of war is not peace. Social insurrection comprises the condensation and explosion of thousands of negations, yet it does not contain even in a single one of its atoms, nor in a single one of its moments its own negation, its own end. This always comes heavy and gloomy like a certainty from the institutions of mediation and normalisation, from the left promising voting rights at 16, disarmament but preservation of the pigs, a welfare state, etc. Those, in other words, who wish to capitalise political gains upon the wounds of others. The sweetness of their compromise drips with blood. Social anti-violence cannot be held accountable for what it does not assume: it is destructive from end to end. If the struggles of modernity have anything to teach us, it is not their sad adhesion upon the subject (class, party, group) but their systematic anti-dialectical process: the act of destruction does not necessarily ought to carry a dimension of creation. In other words, the destruction of the old world and the creation of a new comprise two discrete but continuous processes. The issue then is which methods of destruction of the given can be developed in different points and moments of the insurrection. Which methods cannot only preserve the level and the extent of the insurrection, but contribute to its qualitative upgrading. The attacks on police stations, the clashes and roadblocks, the barricades and street battles now comprise an everyday and socialised phenomenon in the metropolis and beyond. And they have contributed to a partial deregulation of the circle of production and consumption. And yet, they still comprise in a partial targeting of the enemy; direct and obvious to all, yet entrapped in one and only dimension of the attack against dominant social relations. However, the process of production and circulation of goods in itself, in other words, the capital-relation, is only indirectly hit by the mobilisations. A spectre hovers over the city torched: the indefinite wild general strike. The global capitalist crisis has denied the bosses their most dynamic, most extorting response to the insurrection: “We offer you everything, for ever, while all they can offer is an uncertain present”. With one firm collapsing after the other, capitalism and its state are no longer in a position to offer anything other than worse days to come, tightened financial conditions, sacks, suspension of pensions, welfare cuts, crush of free education. Contrarily, in just seven days, the insurgents have proved in practice what they can do: to turn the city into a battlefield, to create enclaves of communes across the urban fabric, to abandon individuality and their pathetic security, seeking the composition of their collective power and the total destruction of this murderous system. At this historical conjuncture of crisis, rage and the dismissal of institutions at which we finally stand, the only thing that can convert the systemic deregulation into a social revolution is the total rejection of work. When street fighting will be taking place in streets dark from the strike of the Electricity Company; when clashes will be taking place amidst tons of uncollected rubbish, when trolley-buses will be closing streets, blocking off the cops, when the striking teacher will be lighting up his revolted pupil’s molotov cocktail, then we will be finally able to say: “Ruffians, the days of your society are numbered; we weighted its joys and its justices and we found them all too short”. This, today, is no longer a mere fantasy but a concrete ability in everyone’s hand: the ability to act concretely on the concrete. The ability to charge the skies. If all of these, namely the extension of the conflict into the sphere of production-circulation, with sabotages and wild strikes seem premature, it might just be because we haven’t quite realised how fast does power decomposes, how fast confrontational practices and counter-power forms of organising are socially diffused: from high school students pelting police stations with stones, to municipal employees and neighbours occupying town halls. The revolution does not take place with prayers towards and piety for historical conditions. It occurs by seizing whatever opportunity of insurrection in every aspect of the social; by transforming every reluctant gesture of condemnation of the cops into a definite strike to the foundations of this system.